Preheat oven to 350°F. In a large bowl, using an electric mixer on medium, beat the sugar and butter with the water until smooth. Blend in the eggs and vanilla. Add the flour, cocoa, baking powder and salt. Blend until smooth. Stir in the chocolate chunks. Spread into a greased 13″x 9″ baking dish. Bake 30-35 minutes or until toothpick inserted into center comes out slightly sticky. Meanwhile make the Coconut Pecan Frosting. Pour the evaporated milk in a medium saucepan over medium-high heat. Add the sugar, egg yolks, butter and vanilla. Stirring occasionally; bring to a simmer. Stir until slightly thickened. Remove from heat; stir in the coconut flakes and chopped pecans. Cool slightly. Spread Coconut Pecan Frosting on top of cooked Chewy Chocolate Chunk Brownies. Allow frosting to set. I make a cookie using chocolate chunks and they add a lots of good chocolate flavor. Your frosting sound delicious too. Happy Fiesta Friday and thanks for coming to the party. Oh wow, when I was a kid my parents used to let us choose our birthday dinner and birthday cake. I invariably chose Stroganoff for dinner, and either a pecan pie or German Chocolate cake for dessert. This looks incredible! 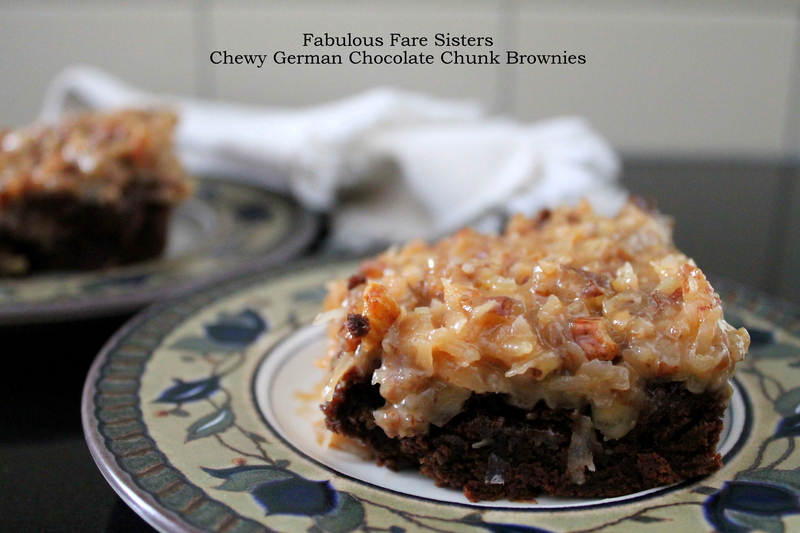 If I ever want to make some German Chocolate goodness in the future, then I sure know where to find it! Wow, Linda these look out of this world. 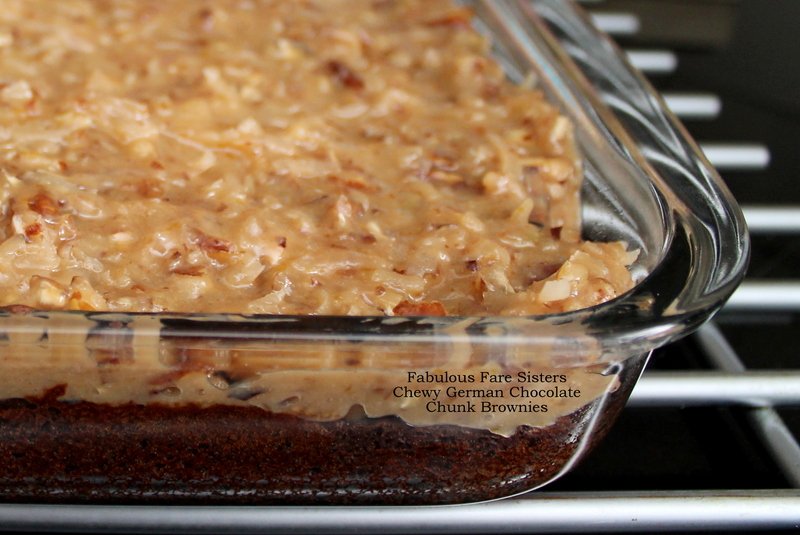 I love the idea of using the German chocolate cake frosting on brownies…yum! Oh my goodness! I’m drooling! I’m not a fan of coconut, but these look yummy!